Today we are Essex-bound visiting Brown & Geeson – a parts supplier and manufacturer that’s had a strong presence in the motorsport sector since its inception over 50 years ago. 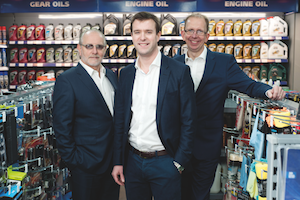 In fact, the company first started out as an accessory shop in Chadwell Heath, set up by father and son duo Ray Brown and Arthur Geeson, which saw the integration of B-G aftermarket accessories in the form of fuel pumps, seat covers and wheel trims among various other components. 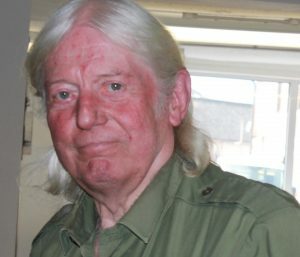 However, the turning point in business came when Ray discovered the importance of self-branding, as his son Sean explained: “At the time, my father realised that by buying something in, putting his name on it and in his own packaging, he could sell his products worldwide and that’s how the business started to grow”. 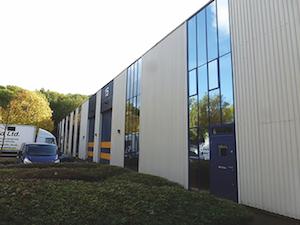 Following expansion plans, the business partners relocated to larger sites in Plaistow East London and Dagenham, Essex respectively, where bespoke production facilities were introduced for serving VMs, importers and parts manufacturers across the country and abroad. This eventually led to another desirable location in Wickford in the mid 90’s, however, there were plenty of major changes ahead: “The UK manufacturing industry back then was quite tough, so myself and my father Ray made a decision to sell all contracts, machinery, shutdown the company and start what was ‘Brown & Geeson Distribution’.” said Sean. “The decision was taken to come out of manufacturing and concentrate on buying and selling from where Brown & Geeson originally started” adding that the firm eventually reclaimed its original name and returned to manufacturing, that’s now outsourced overseas. 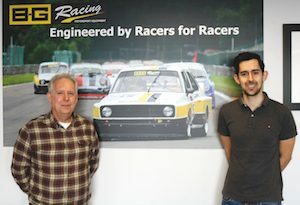 As it stands, Sean and son Daniel head-up the operation of whom have extensive experience in motosport both on and off track. They greeted and took us through to an office space displaying styling products such as the infamous Momo steering wheel and numerous accessories behind shiny glass cabinets, along with mannequins dressed head to toe in Team GB race wear. Display bits and pieces aside, Sean was keen to get down to business and discuss the B-G Racing brand that is now in its sixth year. Speaking of how it came about, he said: “What we needed to do with Brown & Geeson was go back to the old days where we sold boxes with BG logos on it. I believe there are products not only for pit equipment but also for setup equipment.” He continued: “On travels around the world, I have visited paddocks in Europe and noticed gaps in the market for premium products. I thought I could create something similar and bring it to the masses, not only to ‘educate’ but give the top teams a quality product for an affordable price.” He adds that the BG platform has been well received so far as the organisation’s distribution base now stretches globally. Daniel agrees and expands on his father’s sentiment: “The B-G Racing brand is growing steadily everyday. We target distributors in different countries so instead of selling directly to the public, we target trade and retail shops in France, Germany and many more countries. 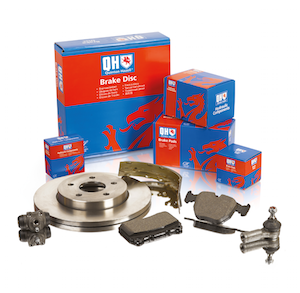 We try and offer them a whole catalogue solution so they can source all their necessary parts from one place to simplify the purchasing process”. Sean notes that the team have recently released their Seventh Edition catalogue packed with vehicle, setup and pit equipment for motorsport and aftermarket companies. 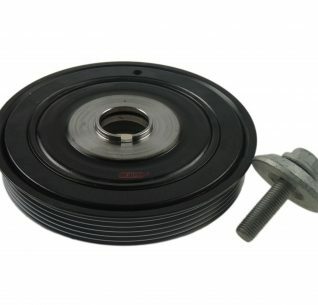 Some of the popular sells he notes include: lift jacks, work mats and hub stands, plus camber/ caster gauges and levelling trays for technicians whether they’re working in a garage or pit lane. 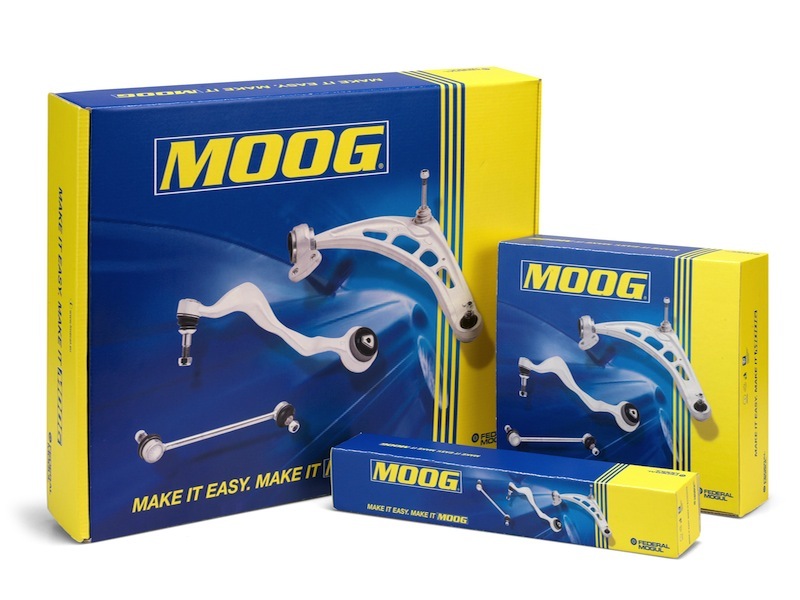 In addition, the brand is a supplier of car components from Australian firm Aeroflow Performance and Mittler Bros Machine & Tool. After a business insight, Daniel and Sean provided us with a tour of the facility. During our tour, the shop floor seemed well organised with Momo and B-G Racing wares stacked along the aisles in an orderly fashion as they await distribution. The top floor comprised of more styling accessories and an in-house studio where new products are photographed before being uploaded to the firm’s website. 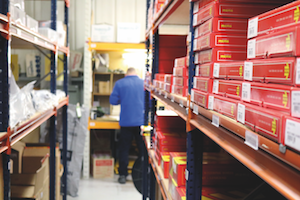 To speed up productivity, Daniel told CAT that a new barcoding system has recently been implemented to get the product logged, onto the shelves and out the door to reduce stock discrepancies with customer orders. Of course, with any queries that may arise, the sales and admin department are on-hand and who were very busy on our arrival dealing with customer calls and queries both nationally and internationally. Although the duo have acquired some new OEM and workshop projects, everything is being kept top secret until completion later this year. But for now, Daniel and Sean’s main objective is spreading the BG footprint while continuing to produce products to help bridge gaps in the market. We look forward to catching up with the team very soon. Independent wholesaler Marathon Distribution has acquired two warehouses bringing its’ branch network to 14 sites. The move comes as part of a business strategy to improve its’ Northern logistic operations. The Warrington distribution centre has recently opened its’ doors to trade customers. Meanwhile, construction work on the new Gateshead site is still underway and should be functional by February next year. More branches are in the pipeline. McComas concluded: “We will also be looking to expand into Scotland in 2018 to enable us to service our Scottish customers more efficiently. We’ve already got substantial business in the North East and West of England, so it will make it easier to service those areas and gives us an opportunity to develop the business more, with more frequent opportunities for our stockists.” We look forward to reporting on these new sites when they go live next year. 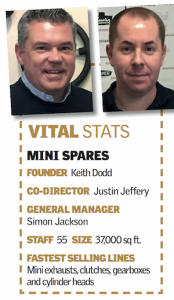 Simon Jackson and Justin Jeffery explain why stock holding is key to the running of Mini Spares. We’re waiting at Mini spares, which differs from the usual display of polish, wheel trims and buckets that usually surround a factors trade counter. 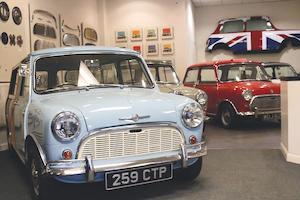 Instead, it looks more like a mock-shop showroom as it has an eclectic range of classic Minis on display. Models to note include a 1963 Morris Traveller, a red 1971 Cooper S and a Monte Carlo Mini on display, among others. To stock the components, the team has continued expanding the warehouse, with extra storage space and several mezzanine floors. As it currently stands, the space totals 37,000 sq ft employing 55 staff across the factory floor, sales and marketing departments. Although a bespoke stock management system is in place, the Mini Spares team have had to adjust their stock holdings accordingly. 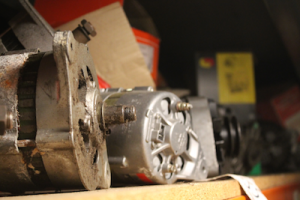 Jeffery elaborated, “Typically, brake and suspension products are some items that used to be bought together and would all be in one place within the warehouse, however, our computer system shows us the quickest way to go around and pick wares in the building. We’ve gone away from that, meaning, staff that have been with us for a long time have had to adapt.” He adds that a fair amount of human intervention is needed to get stock holding correct, even though the system is in place. Jackson agrees with Jeffery’s statement and expands, “Again, how we have to buy things has changed. It’s not feasible to keep certain products together anymore because of the stock holding,” he added, “Where we used to keep 100 items for a certain product line, we now have to hold a 1,000 of them.” To resolve this issue, the team have created a Bulk Storage area, that replenishes shelves as and when required. The firm hassate two satellite branches in Birmingham and York, both supplied from the Potters Bar HQ. “It’s the later stuff that’s dropping off the production lines. People are not interested”, said Jackson. “Volumes are too small [for the main suppliers to be interested in] and that’s what we’re now concentrating on.” He concluded. DENMARK-based distributor JP Group will stop distributing Quinton Hazell brand products from 6th December 2017. The move comes as QH brand owner Tetrosyl prepares to have its new distribution centre fully operational. JP Group provided a relaunch platform for the QH brand since being appointed licensee for Scandinavia and Germany back in 2013. A statement on a Tetrosyl press release states: “It has now been agreed that in order to increase the current commendable distribution routes established by the JP Group that Tetrosyl Ltd will continue the development of these markets directly”. League’s Southern Premier club and stadium sponsor. 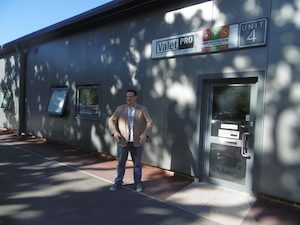 Tetrosyl’s Distribution Centre is due to be fully operational in October 2017 and will combine the distribution of oils, chemicals, car care and now QH replacement parts all under one roof. This will enable all supplies of QH products within the territories to transfer to Tetrosyl as of the 6th December 2017. Car window blind manufacturer Car Shades, has moved in to a much larger production and distribution facility. The new 24,000 sq. ft facility is on the site of former coalmines in Bilsthope, Northampton. The premises will be shared with Vanstyle, a company in the same group. 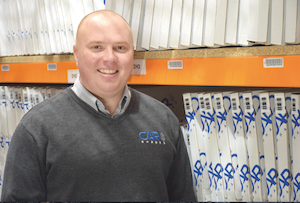 First formed in 2005, Car Shades embarked on an expansion programme in May 2015 when Steve Giles, former Operations Manager and now MD, took control of the firm. Having expanded both in terms of outright size and the number of specific fitment options offered, it was decided that a new site was needed. Commenting on the move, Car Shades MD, and Mansfield local, Steve Giles was clearly delighted at the opportunities ahead. 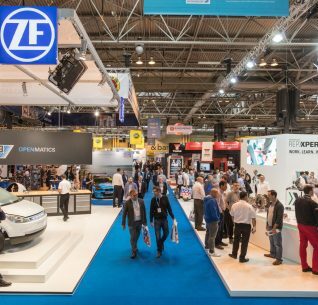 “We’re already proud to be working with some of the world’s greatest automotive manufacturers, and I feel that with the ability to offer increased production and even higher quality control, we’ll continue to buck the current economic trends” he said. The Mini-Ductor II+ induction heating tool is now just £395 + VAT, save £200! For a limited time only, you can order the award-winning Mini-Ductor II+ tool at a vastly reduced price from the UK’s official distributor. 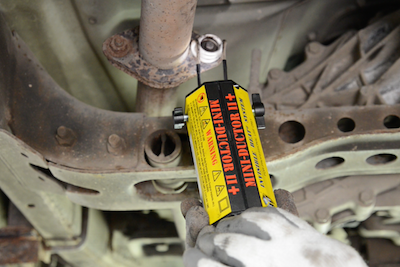 The easy-to-use handheld tool uses invisible, high frequency magnetic fields, which create invisible heat to quickly release corroded and bonded hardware, frozen nuts and bolts, O2 sensors, track rod ends, bearings, pulleys and other hardware that are rusted/thread-locked into place. Increased safety – the heating process does not use a dangerous naked flame and the flameless heat is very localised, so only the part becomes hot, not the tool. Saves time – because the products heat the problem fast and not the area around it, labour can be reduced by as much as 75%, with productivity increased. User-friendly – the tool is very easy to use, with little training required. Reliable – with a low return rate, the technology won’t let you down. 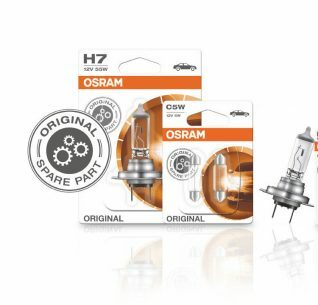 Energy efficient – less consumables used and the running costs are low. 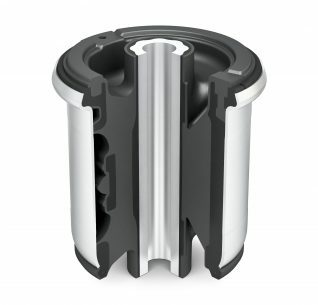 Versatile – the range can be used in a number of different applications. Insurance premiums – if you’re using Oxyacetylene gas you could save 30% off your insurance if you stop using it. Don’t miss this opportunity to purchase your Mini-Ductor II + for just £395 + VAT, saving £200.